These are some of the most common oral swellings but are hyperplastic in nature, resulting from fibrous proliferation in response to chronic irritation often with an inflammatory component. These lesions arc distinguishable only by their site of origin and consist of irregular bundles of collagenous conncctive tissue with varying numbers of fibroblasts covered by stratified squamous epithelium (Figs 186-188), often with mild subepithelial inflammatory infiltrate. Osteoid or bone may form within a fibrous epulis (Fig. 189). 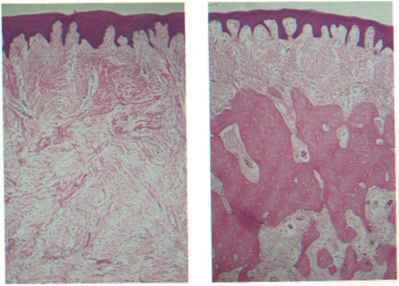 More severe and deeply extending inflammation results from ulceration. Treatment Adequate excision should be curative. Clinically, pyogenic granulomas appear as soft, red nodules, usually on the gingival margins. Despite their name, these are vascular proliferations, but inflammation is frequently superimposed. Many dilated thin-walled blood vessels lie in a loose conncctivc tissue stroma but typically, inflammatory cells fill the vessels and infiltrate the stroma (Fig. 190, p. 104). 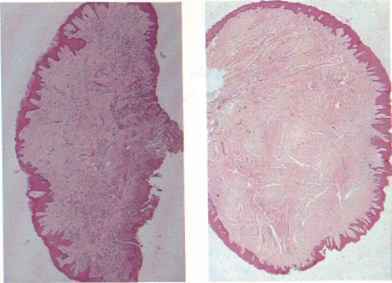 The nodule is covered by stratified squamous epithelium of variable thickness and, particularly in the inflamed type, may be ulcerated. fig. 188 Fibrous nodule: general structure. fig. 189 Bone formation in fibrous epufc. 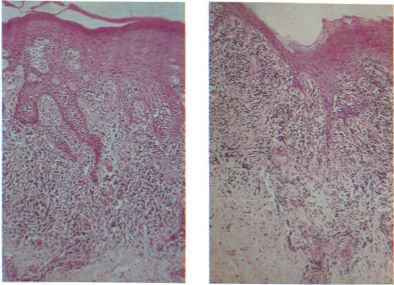 During prcgnancy, hormonal factors favour gingival hyperplasia and formation of pyogenic granulomas (prcgnancy epulis). 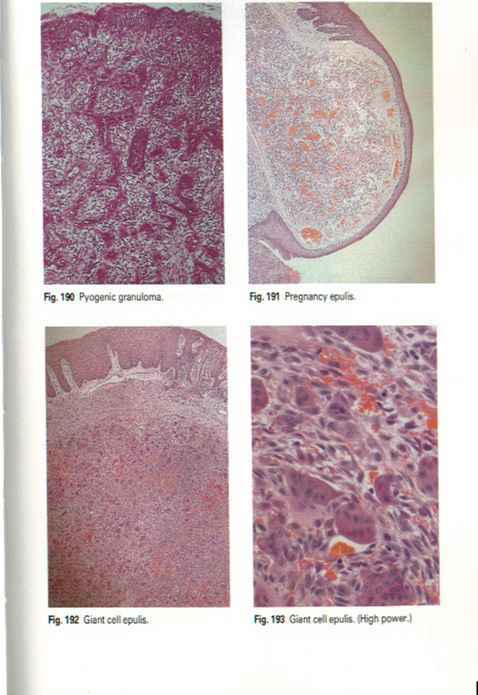 Clinically and histologically these do not differ from pyogenic granulomas seen in non-pregnant persons—only the pregnant stare differentiates them (Fig. 191). Treatment and Prcgnancy epulis is likely to regress after parturition if prognosis oral hygiene is good, but may have to be excised. This hyperplastic lesion is believed to result from a proliferation of osteoclasts from the sites of shedding of deciduous teeth as it is only found in this area of the alveolar ridge and mainly in young people. Exceptionally rarely, hyperparathyroidism gives rise to a giant cell epulis, distinguishable only by abnormal blood chemistry and bone lesions, if present. Microscopy The mass is highly ccllular and crowded with osteoclast-likc giant cells of variable size in a cellular and vascular stroma and covcrcd by stratified squamous epithelium (Figs 192 & 193). If neglected, it may undergo gradual fibrosis with a shrinking core of giant cells surrounded by fibrous tissue.